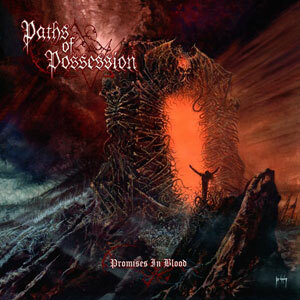 Started in 1999 by Randy Butman , Jay Fossen, and Richard Brunelle (ex-Morbid Angel guitarist), Paths of Possession is a solid mix of traditional heavy metal with influences of melodic Swedish death metal. 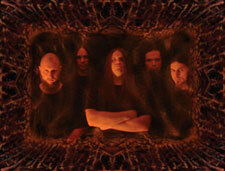 Paths of Possession independently released their first album Legacy In Ashes in 2000 but their next release would not be until 2003, which was a split EP with Dark Faith titled The Crypts Of Madness which is where Cannibal Corpse vocalist George 'Corpsegrinder' Fisher first entered the band. In 2004 Richard Brunelle was replaced by current guitarist Jack Goodwin and current member Nick Goodyear stepped in to take over drumming duties. Paths of Possession played locally around Florida when George wasn't recording or out on tour with Cannibal Corpse, which unfortunately didn’t leave much time for a full US tour. 2005 saw Paths enter Mana Recording Studios/Razzor Media in St. Petersburg, FL to record Promises in Blood, their first full length in five years, with renowned metal producer Erik Rutan (Hate Eternal, Soilent Green, and Into the Moat). Once the recording was finished, Promises in Blood was sent off to West Side in NY to be mastered by Alan Douches best known for his work with artists such as Nile, Sepultura, Hatebreed, Clutch, Unearth, Misfits, Mastodon, Shadows Fall, The Dillinger Escape Plan, Converge, and Earth Crisis just to name a few. With this much collective talent on board the end result is one hell of a brutal yet catchy metal album that is sure to ensnare its unsuspecting victims into its malevolent whirlwind of headbanging and fist pumping metal. The one thing listeners should not expect to hear in Promises in Blood is Cannibal Corpse Part 2 as Paths of Possession is an entirely different beast right down to the vocals. Paths of Possession showcases George “Corpsegrinder” in a more melodic environment, with song structures that have much more in common early Bay Area Thrash then the Tampa Death Metal scene that he continually defines. Also the band was formerly known as Swollen. According to the band's myspace, they are working on a new album. Recording is set to start on January 6th, 2007.